Fun and flirty, this retro-stripe casual dress is great for vacations or a day at work. 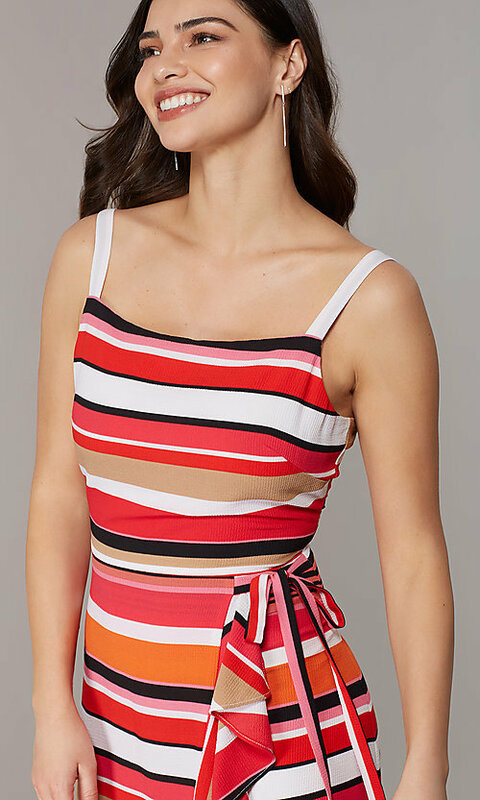 The pink and orange striped dress, crafted from jersey ribbed-crepe fabric, has a sleeveless square-neck bodice with supportive shoulder straps. The knee-length faux-wrap skirt ties at the side, and a ruffled flounce flatters as it runs vertically down to the hem of this retro-striped casual dress. At under $100, this casual party dress with pink and orange stripes is on-point for family get-togethers, shopping sprees, and bridal showers.